The story of Zacchaeus: one of the most famous vertically challenged people in the bible! In verse 9, Jesus says, “Salvation has come to this house, because this man too is a son of Abraham”. It might have been curiosity. It might have been because of the things people said about Jesus; it might have been the fact that Jesus had been nicking some of his employees. Zacchaeus was a chief tax collector – and he was the man who would have been left with the headache when someone like Matthew left everything to follow Jesus. We don’t know. It was a real desire. We know that, because he was not put off by other people. He is a small man, there is a big crowd, and they’re not going to let him through. So Zacchaeus swallows his pride, gathers up his robes and climbs the tree. In our passage today, we meet gentle Jesus meek and mild! As if! So what is going on here? Is Jesus having a bad hair day? He’s hungry. He sees the fig tree. He goes over to get a fig, but there is no fruit. So he zaps the tree. The setting is significant. Jesus has just entered Jerusalem in triumph. He deliberately sets out to fulfil the prophecy of Zechariah. We saw that last week. He is God's king coming to God's city. He is coming to his throne. And in these verses what we see is that God’s king comes to God’s city and he finds it wanting. The fig tree is cursed because it is not bearing fruit. We are told the reason it is not bearing fruit: it is too early on in the season. But it doesn’t change the issue. Jesus is looking for fruit. And if the fruit is not there, then there will come a time when God will act in judgement. It is a real privilege to be able to celebrate this service with you today. We come to give thanks to God for those who fought in the Battle of Britain, for the outcome of that battle, and also to give thanks for those - who, in that same spirit - have continued to serve in the Royal Air Force. And we have here men and women who have served with the RAF regiment and with the USAF in Iraq and Afghanistan. We give thanks to God for you and for your families. And we also remember before God those who have given their lives, and their families. And on behalf of this town and church I wish to say that we are immensely proud to be associated with you. There are moments, often extremely rare, when the scales fall away and we see reality as it is. It is a bit like looking through a microscope or telescope. What we thought was a blob suddenly appears transformed into something wonderful. Well, in a sort of way, that is what happens here. Peter, James and John are given a glimpse of reality, of ultimate reality. 1. He is the messiah, the Son of God. I wonder who or what we follow? Most of the time we are following things or ideas or people without realising it. We follow the crowd. We do things in a particular way because that was how we were brought up or because ‘everybody’ lives this way. And if we start to be different, we begin to worry: ‘am I a freak’? Sometimes we consciously follow something. It might be a team or a hobby or a career; fashion – the girl dressed up in the Goth gear is making a statement: she is saying – ‘I’m not following you - I’m following an alternative society’. Or we follow a cause: cats, the environment, anti-war. I had an eccentric uncle who waged a one man campaign against the putting of fluorine in water. I suspect that many of us have been brought up to think of the Trinity as a problem to be solved: a mathematical conundrum. How can 3 be 1 and 1 be 3. And so we have heard the Trinity described as a venn diagram, or as ice-water-steam, or as one person in three roles. May I very apologetically suggest that you forget them. They are actually about as useful as Robbie Coultrane in Nuns on the Run. The Trinity is not a problem to be solved. The Trinity is about a life to be lived. Three figures seated around a table. They’re the three angels who appear to Abraham at Mamre – when they tell him that he is going to have a child. 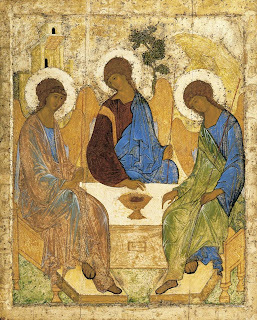 Christian tradition very quickly identified them with the three persons of the Trinity. Notice how, although there are three figures, there is a unity about them.